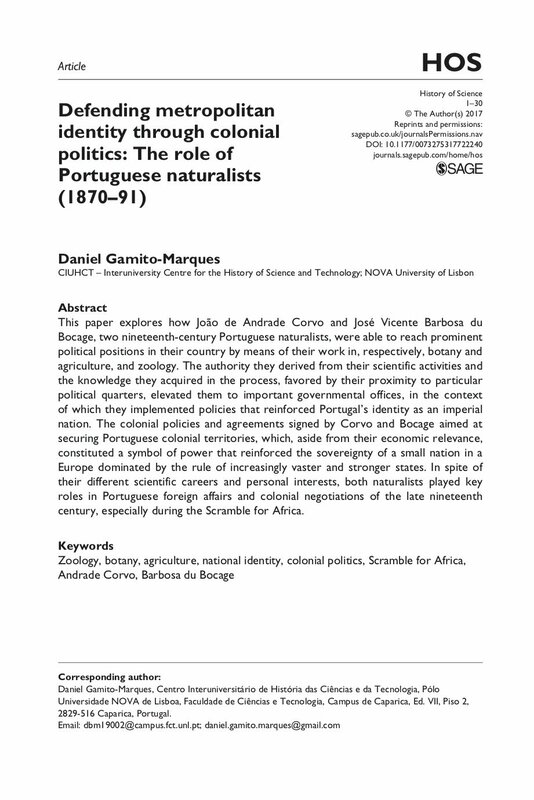 This paper explores how João de Andrade Corvo and José Vicente Barbosa du Bocage, two nineteenth-century Portuguese naturalists, were able to reach prominent political positions in their country by means of their work in, respectively, botany and agriculture, and zoology. The authority they derived from their scientific activities and the knowledge they acquired in the process, favored by their proximity to particular political quarters, elevated them to important governmental offices, in the context of which they implemented policies that reinforced Portugal’s identity as an imperial nation. The colonial policies and agreements signed by Corvo and Bocage aimed at securing Portuguese colonial territories, which, aside from their economic relevance, constituted a symbol of power that reinforced the sovereignty of a small nation in a Europe dominated by the rule of increasingly vaster and stronger states. In spite of their different scientific careers and personal interests, both naturalists played key roles in Portuguese foreign affairs and colonial negotiations of the late nineteenth century, especially during the Scramble for Africa.